Comments on "At Bottega Veneta -Plaid Jacket"
hmmm...i just don't see a sense of connection between the pieces of this outfit. the jacket seemed too long, the pants need a bit of touching up. a nice twist to the blue/grey combination. i really like the jacket with the shoes. well done sir! I do love the combination of a colourful tweed jacket and grey flannels (although I prefer less of a break at the hems). What makes this outfit for me are the tan oxfords and the cravat, which is a far more stylish option than an open neck. Why do people decry the wearing of cravats? That's a great look. The grey pant with an earth tone blazer and brown shoes is a (new?) classic. I like everything but the popped collar! Perfect! What a good-humoured ensemble. It's cute how his squarish headshape matches with the squares on his plaid jacket. I love this jacket ...the colors ...the shape...most importantly for me ...it is bold plaid in erath tone colors which maks it easiier for someone like me (6ft 3in) to wear . I don't want to look like the size of a floor to celing window panel as I am walking the street. The jacket is great too. You gotta have pride to wear it that loud. Though the plaid's nice, in total, this ain't my cup of tea: the pants are ill-fitting and too long, and what gives with the slight jacket-collar turnup in back? Love this look! 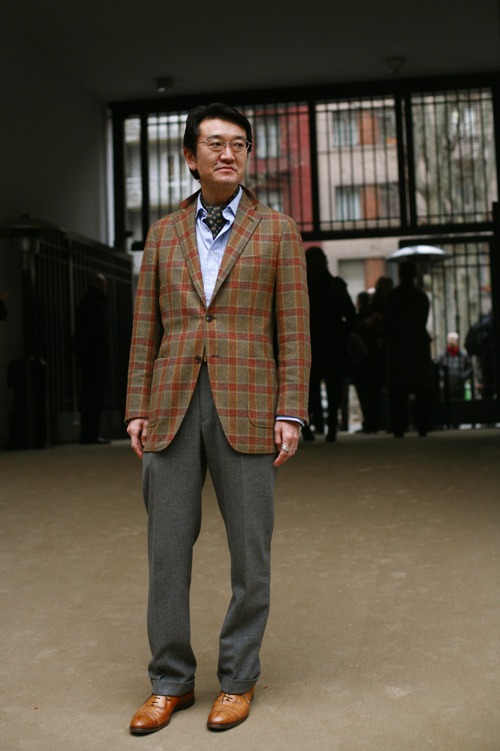 Beautiful 2-button jacket, excellent trousers w/cuffs, nice shoes. But most of all...I love the cravat!!! Men don't wear cravats often enough, IMO. Although the jacket , the trousers , the shoes , the shirt and the scarf are of high quality and very well combined , the final effect is not elegant at all. The elegance needs something else, not present here. I love the chestnut shoes with the gray trousers. I love the bigger cuff and the nice break. I don't think I'd like the jacket if I'd seen it not paired with the rest of the outfit. what perfection in matching the stripes all over. you don't see that often. splendid, just splendid. i think that is just about the cutest thing i've ever seen. love the scarf detail! it might have looked too casual without it. I don't think his jacket is too long at all. The rule of thumb that I've heard, and the one that I always follow, is that the jacket should be long enough for you to hold the bottom with your hands, any longer would be too long. What a spiffy looking gent! An odd combo, but it definitely works: he stands out. Agreed with Anonymous at 3:17. Let's see some personal pics of these perfectionists. I am familiar with that rule of thumb, but with a bit of a variation. I was taught that you should be able to hold your arm straight down, fold your fingers up until they touch your palm, and your jacket should lay right in your hand. That said, the jacket may be a little long. Otherwise, the overall fit of the jacket is decent. I do dig the color combo and the popped collar, though. The comments on the Sartorialist are, as always, fascinating. I wish people would put down where they are from because when I read these posts I think - "must be US, maybe West Coast, must be NYC, might be London, etc" and it's interesting to see trends in taste depending on the person's location. As for the look, it's a classic man's look with a few small touches that set it off. 1. The rings on the finger. 2. The shoes with the slightly darker tips. 3. The jacket pattern - bold, especially because of the size of the stripe between the squares. The colour combination is nothing new. There was a Zegna look like this two years ago for their winter collection. I think it's a great and not-oft seen comination. I'm still on the fence with Ascots. Yes, they seem a little pretentious, but on the other hand, they add a beautiful slice of colour around the neck. It's a classic look with a classic fit. The trousers are quite full, the big cuff goes well with it and the waist is high. These three things go hand in hand and it would difficult to separate them. Can you imagine full, short trousers? Those are capris! Low-waisted full trousers? Too gangsta. I think the trousers go extremely well with the relaxed look of the jacket. It pinches only very slightly at the waist and has big patch pockets. I find nothing wrong with the length at all. Referring to an earlier poster's comment about the rule for jacket length: "... jacket should end where first knuckle of thumb is..." I find the overriding rule to that is: "The length of the jacket should be equal to the length of trousers shown". People's arm length vary a great deal and it makes the earlier poster's rule a difficult proposition for people with long arms. I don't know what the negative comments are all about but this guy looks fantastic. I would go so far as to say he's one of the best male looks I've seen on this blog, for a while. He looks original, personalized, but still very stylish. The matrch between the plaid jacket and the shoes and the cravat is absolutely necessary. You did a great job SSir, take a bow. I think all the individual pieces of clothing are great. I just don't see how he brings them together. The ascot, which is beautiful, doesn't really seem to match the outfit. But kudos to him on at least having nice pieces of clothing; the shoes, slacks, jacket, and ascot are all great. It's just the combination.. Also, did you notice that his collar is turned up? Is that in error, or have I missed a new style? when a pattern is as ... bold .... as that, you want to break it up so it doesn't dominate quite so much - don't button the jacket, for sure, and maybe add a pocket square. he's a lefty and his arms/shoulders are different lengths/sizes. you can see how only one sleeve is perhaps a touch too long. i have the same problem with all my jackets. i have come to like the asymmetry of it. He would do well in a sartorial face-off with the Bald Fat Man! I like the shoes. I should like the orange plaid, but have to admit I am not crazy about it here. Damn that crumpled collar. There must be a better way. This is a great look! The jacket looks slouchy but not messy, Great cut! Pants are great, not too baggy nor slim-fitting...it's perfect. If you don't see the connection, you must be blind. he's so precious! i love the way the colors work together, i like the shoes, and i love the ascot. I read all the comments, seem to be lot of different opinions. Thats a good look, love the cravat. Takes a lot of sartorial cojones to work that. I likes. I just love this!!!! very English indeed,i think ascot looks great on him. Love the fit of the jacket. It's the first one I've seen on here in a long time that doesn't look too tight, even though it's fitted at the waist. What's the deal with the current trend (per the way so many appear in Sart's blog photos) for men's jackets to gap below the button and show a slice of whatever's underneath: a bit of tie, a belt, and part of a shirt? It's so distracting! Does anyone else think this makes the jackets look too small? Really love this blog by the way. Thanks for posting such marvelous images.